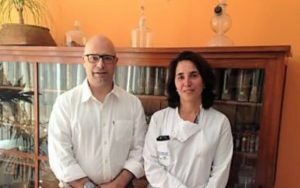 The research team of the Santa Maria Hospital Neurology Service, the Faculty of Medicine of the University of Lisbon and the Institute of Molecular Medicine, coordinated by Professor Leonor Correia Guedes, and integrated into Professor Joaquim Ferreira‘s Research Group, collaborated in the discovery of new genetic alterations associated with the emergence of Parkinson’s, Dementia Associated with Parkinson’s and Dementia with Lewy Bodies. Led by Professor Vincenzo Bonifati, from the Erasmus Medical Center in Rotterdam, the international research team has identified, for the first time, changes in the LRP10 gene that are associated with the onset and development of these diseases. Parkinson’s and the Dementia with Lewy Bodies are neurodegenerative diseases whose causes are still largely unknown. Although cases of genetic origin are rare, the identification of new genes is extremely important in order to better understand the brain changes that cause disease and to develop new drugs. The article now published in the Lancet Neurology journal describes the clinical and genetic studies that linked the LRP10 gene to Parkinson’s and Dementia with Lewy bodies, describes the subsequent analyses of the protein encoded by the gene, and also the neuropathological studies that documented the accumulation of the alpha-synuclein protein in the brain, characteristic of these diseases. The identification of the association between the LRP10 gene and the development of Parkinson’s and Dementia with Lewy Bodies allows opening new avenues of research for a better knowledge of these diseases and for the discovery of new treatments. How did the collaboration between the team of Portuguese researchers and Professor Vincenzo Bonifati, from the Erasmus Medical Centre in Rotterdam, come to be? Prof. Leonor Correia Guedes: The collaboration between our clinical research team and Prof. Vincenzo Bonifati arose because of the common interest in identifying new hereditary forms of Parkinson’s disease. The current international collaboration began with Prof. Joaquim Ferreira, Prof. Cristina Sampaio and Prof. Vincenzo Bonifati in 2004, with the study of the first families where the LRRK2 gene was identified, a gene whose mutations are still currently considered the most common known cause of Parkinson’s disease. Since that date, we have developed several joint projects, and now the identification of the LRP10 gene is the latest fruit of a continuing clinical research effort, with the identification and clinical study of many patients and families over the past 14 years. It has been a fruitful and very rewarding collaboration. How important is the discovery of variations in the LRP10 gene in patients with Parkinson’s disease and Lewy Body Dementia? Prof. Leonor Correia Guedes: Whenever we find that variants of a particular gene are associated with the development of Parkinson’s disease, and, in this case, also the development of Lewy Body Dementia, we have identified that the protein encoded by this gene may be directly involved in the pathophysiology of these diseases. Thus, identifying the association between the LRP10 gene and Parkinson’s disease and Lewy Body dementia may allow us to expand our understanding of the molecular basis of these diseases and possibly identify new therapeutic targets. With the results of this study, new questions arise. Can you tell us what follows in the near future in terms of research in this field? Prof. Leonor Correia Guedes: Regarding the LRP10 gene, functional characterisation studies of the protein, clinical studies characterising the phenotypes associated with the variants found and neuropathological studies in mutation carriers have now started, within our project. In the medium term, a deeper knowledge of the molecular bases associated to these variants may allow identifying new therapies.